Certified reading specialist Linda Gross, Ed.M., explains how color plays a pivotal role in aiding students with retention, memory and enhancement of their learning experience. 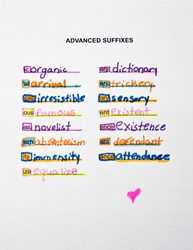 “Shown here is an example of how one of my students utilized different colors to help her successfully remember advanced suffixes,” says Linda Gross, Ed.M. Ever read to the end of a page and then ask yourself, 'What in the world did I just read?' It's essential to constantly wake up your brain by changing the colors to keep your brain engaged. With the end of the school year fast approaching, students will soon be inundated with lots of reading and studying in order to prepare for final exams. Throughout the academic year, students are constantly exposed to lectures, facts and figures, but are they really learning how to study all of this information? The results from the 2012 Program for International Student Assessment (PISA) suggest the answer is “no.” According to the National Center for Education Statistics, teenagers in the U.S. slipped from 25th to 31st in math since 2009; from 20th to 24th in science; and from 11th to 21st in reading. While these statistics may sound dismal, Linda Gross, Ed.M., a state-certified reading specialist and kinesiologist with over 25 years’ experience in education, says there are things that teachers and parents can do to help kids learn to incorporate study techniques that are not typically taught in school. Below, Gross shares the following strategies students can immediately use to obtain excellent results. Many students use highlighters when reading and have been taught that it’s important to illuminate the main points. But is that the best way to use them? According to Gross, the answer is yes…and no. “The first question I ask students is what color highlighter do you use?” Gross says. “Yellow? Pink? Orange? The ‘trick’ is to use all of the colors. I tell them that if they only use one color, they might as well not even bother because their brains will surely ‘turn off’ as if they were reading black and white. Ever read to the end of a page and then ask yourself, “What in the world did I just read?” This is an all-too common problem, which is why Gross says it’s essential to constantly wake up your brain by changing the colors to keep your brain engaged. Another popular study technique is the use of ubiquitous flash cards for vocabulary, spelling, math facts, etc., but Gross says most students are not using them to their fullest potential by making a common mistake: using only white index cards. During her more than two decades of working with students, Gross says she has seen first-hand their test scores improve significantly when utilizing these study techniques. Most importantly, she adds, students say that studying has become a more enjoyable experience. 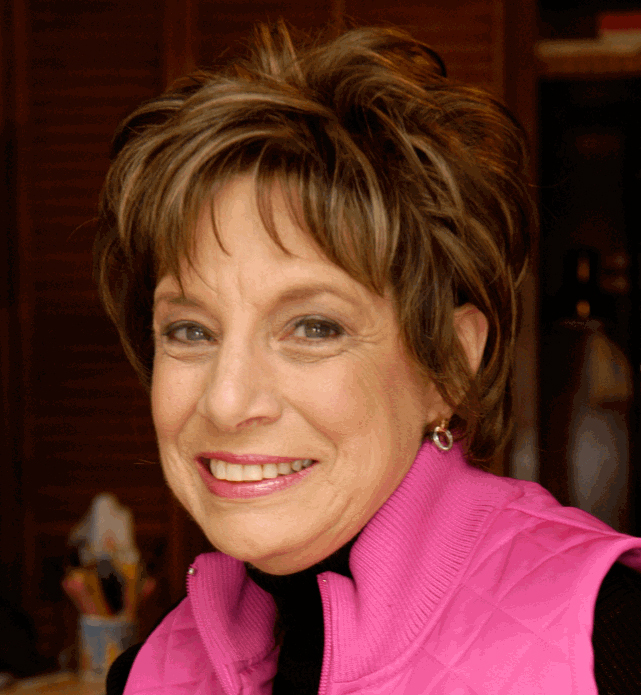 Linda Gross has a Master's Degree in Reading Psychology and is a state-certified reading specialist with over 25 years’ experience in education. Having completed extensive post-graduate work in Reading Psychology at Temple University, she continues to take courses to enhance her ability to serve people. Ms. Gross specializes in multisensory instruction and is a proponent of Orton-Gillingham principles. In addition to having a private practice, she is an adjunct instructor at Community College of Philadelphia where she teaches reading, writing, and study skills. Ms. Gross combines her extensive academic background with holistic kinesiologic programs in order to provide an "integrative education" experience. She has developed the LRG Method® which combines Western academic programs and Eastern energy-balancing techniques to balance the brain and provide maximum reading success. Linda is constantly utilizing techniques (many from applied kinesiology programs) and exercises that will foster left and right brain integration in order to remove stress and learning blocks, increase attention and concentration, and maximize brain function. In addition to her private practice, Ms. Gross consults with public and private schools, teachers, and homeschool parents. Reading Specialist and kinesiologist Linda Gross, Ed.M., (pictured) says by incorporating color with study techniques, students can significantly increase retention and test scores.